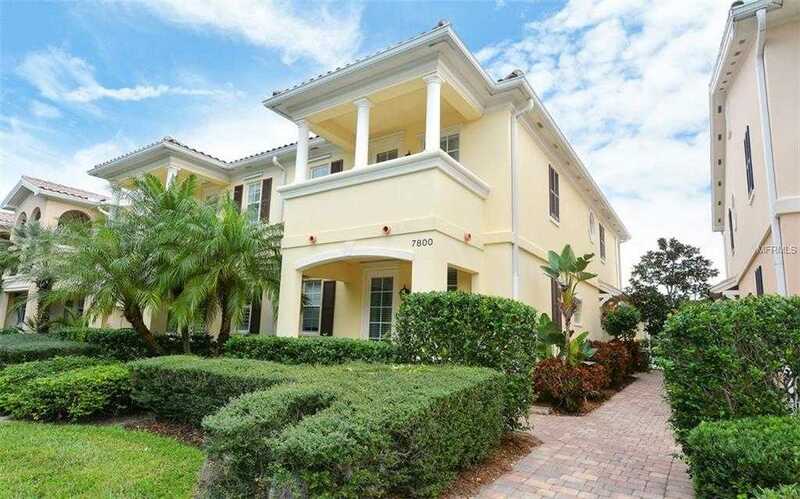 Stunning Cayman model townhome in the sought after community of Villagewalk. Shows like new, with calming colors and an inviting interior. Exceptional upgrades include wood look ceramic tile floors, wrought iron details on the staircase, crown molding thru out the first floor, tile backsplash, granite counters, and stainless appliances in the kitchen. A double master bedroom plan with walk in closets and full baths. A private porch off the front master perfect for enjoying the evening sunset. A large screened lanai with plenty of room for entertaining guests. Villagewalk is a gated Resort style community with a Clubhouse, event space, fitness center, 6 har-tru tennis courts, 13; a geo thermal heated resort pool, lap pool, gas station, restaurant and miles of walking and biking trails. Call today to see this amazing home. Please, send me more information on this property: MLS# A4424330 – $315,000 – 7800 Andora Dr, Sarasota, FL 34238. I would like to schedule a showing appointment for this property: MLS# A4424330 – $315,000 – 7800 Andora Dr, Sarasota, FL 34238.